According to Michael J. OBrien, president of Signature Technologies, Dallas, TX, controls must be broken down into two categories -machine controls and process controls. "The integration of die protection or tonnage monitoring into the press control is a desirable feature but it limits the quality of the end product and performance if the firm building the press controller does not have or acquire expertise in these two fields. Thus, what we have seen in the past few years has been the birth of the integrated system lacking robustness in areas beyond machine control. "The need for more precision and integration with other plant-floor devices and information systems will require a migration to standard platform products, such as PCs. The first step in this direction was taken with the PLC or programmable logic controller. However, the latter, although facilitating user programmability, is still considered a proprietary device. We see that controls will move in the direction of PC-based devices that provide the user with an open choice of hardware for both processing and input/output devices. Thus, components need not be of the same manufacture and can be multi-sourced," OBrien explains. "Process controls," OBrien says, "are all but non-existent in the metalforming industry. Process controls can be defined as devices that can measure, assure and optionally correct variations in the process in order to maintain consistency of part quality. The products and technology exist to perform process control, however, what is absent is the focus of the driving forces in our industry. In fact, most industry leaders do not even understand the term, process control. "The most important advances have been in the areas of die protection and signature-based process control. The reason that these advances are so important is that they force the user to focus on the process. Die protection gets the user to identify problem areas in the tool in order to apply sensors to detect such problems. The real benefit here is that the user needs to understand the tool, and therefore gets exposed to a small part of the education process. Unfortunately, most current users of die protection systems do not apply in-die sensors and therefore fail to gain that process knowledge. "Signature-based process control is totally focused on the process. Its sole purpose is to identify, measure and verify consistency as well as provide correction output to control the process. All variations in the process, tooling, equipment, environment, material, lubrication, etc., that change a signature, have an effect on the process, and therefore, can be analyzed and their effect on the process can be determined. Aside from the obvious benefits of process verification, the ability to see the process, combined with human reasoning, opens the doors to major advancements in metalforming technology. "An example of just how far we are behind is the level of automation and quality of product found in industries such as petro-chemical, water/waste water, pharmaceutical and automotive. Just look at what happened under the hood of an automobile once process control technology was applied by adding sensors, a processor(s) and software. "Today, our automobile goes 100,000 miles without a tune-up. It starts reliably in all kinds of weather, and offers many features unheard of just 10 years ago. In the automotive industry, factors that forced these changes were non-U.S. competition, quality problems of trying to do complex functions mechanically instead of electronically and environmental regulations that required understanding and much closer control of the process. "Where are these motivators in the metalforming industry?" OBrien asks. 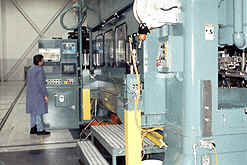 Shown is a signature-based process control system, from Signature Technologies, installed on a Minster press at A.J. Rose Manufacturing Co., Avon, OH. A newer version of signature analysis, this system uses force transducers to enable the machine to "feel" the parts as they are being formed. There is a significant amount of obsolete equipment in U.S. manufacturing operations," observes Mike OBrien. "The biggest problem with this equipment is not its age so much as its condition. I am continually amazed at the lack of understanding that exists within the operations department in regard to the dynamics of equipment and how it affects the process. A better understanding in the latter would significantly improve the ability to properly choose equipment to fit specific process needs; i.e., to know where the limits are in an old piece of equipment and what parts can be run that will not be affected by those limits. "Are American plants modern?" asks OBrien. "Not by European standards, but they probably are average for the world as a whole. Many Japanese plants are not modern, but their equipment is maintained in good condition and close to original specifications. "I believe that manufacturers can afford to update and replace current equipment. Many who do, however, fail to make the proper investment in training so that they can obtain the return on investment (ROI), that makes the new purchase decision valid. "The problem I see repeatedly is the purchase of modern equipment that is operated by an old workforce, which gets training in operating the equipment but not in why the equipment was purchased, where the benefit is to the company and how the new equipment can benefit them or improve their own performance. Many times operators know how to operate the new equipment but dont really understand what it does. "Safety usually is an issue of training," says OBrien, "but it also is an issue that involves proper design of machinesnot allowing production management to have the capability to override systems. Many times permitted overrides around control logic by production result in safety overrides due to lack of knowledge on the part of those performing the override." "I believe that North American companies do compete in international markets," exhorts Michael OBrien. "Those who do it are succeeding because of the technology they can lever; i.e., they have the ability to use technology to overcome cheap manpower. However, I have noticed one very significant threat. The Asian market, which does not have the inventory of equipment and yet has the largest emerging market, currently is buying new equipment with the latest technology and options. "In the U.S. market, the average metalformer finds that the cost of adding the same new technology and options to existing machines is in the price range of what was paid for the machine 20 or 30 years ago. This painful reality cools the desire to make the investment. "Meanwhile the Asian competitors really have no choice since they have no equipment. The result is that the Asian company is investing in new technology and implementing it whereas the U.S. metalformer may wait until its too late. Also, the Asian company has to train its workforce on equipment that has new technology, thus the worker accepts this technology as part of the machine. The U.S. worker, who has been using a machine for years, cant understand how this new box on the machine is going to help. This is a very significant issue. "Asia poses the biggest threat to U.S. manufacturing because it is located locally to the largest emerging market - itself," OBrien explains. "Asia has to build infrastructure in manufacturing technology and is investing both finances and its resources in technology, which it perceives as state-of-the-art. Yet, the same technology in the United States is perceived as leading edge. The United States is waiting for these new technologies to get away from an edge that does not exist. Europe does not appear to be a big issue other than its ability to compete with U.S. equipment manufacturers selling to metalformers." Mike O'Brien says there's a problem. "I believe that quality materials are a real issue and U.S. material suppliers have not kept up with their foreign competition, either in new materials or quality of materials. This could pose real problems in a world market since importing materials adds significant cost to U.S. metalformers who need these materials for what are usually high-technology products. The import costs are not felt by their foreign competitors, who usually reside in the country of origin of the materials. "I also believe there are significant advances in materials coming and that the United States is not even in the running," O'Brien continues. "Ten years ago, I attended a conference in Japan given to corporate Japanese executives. The key focus of this presentation, hosted by a Japanese electronic company, was a total commitment to new exotic materials and fabrics that would change the future. The examples given, now reality, were clothing that came in one size and once worn would adjust its size, probably like thermal shrink tubing, to fit the wearer. I have to believe the Japanese have the same dedication to new metals development." Michael O'Brien comments, "I have stated my case about training in many parts of this article. I do not see that industry or schools will properly address the training need because the industry usually is reactive in this area and the schools are focused on their biggest markets, which do not include metalforming workers." "I believe we must have a certification program and that the program must focus strongly on the leading edge and not the status quo. If we are to lead the world, we must instill in our workers an expectation of a work environment that is beyond the status quo in order to move forward. We need to have metalformers competing for talent, not with money, but with the best facilities and tools, thereby establishing pride - instead of resignation - as the driver for working in this industry. "I find many good candidates are turned off by the lack of perceived technology in metalforming, rather than the nature of the plant environment. What better way to attract such personnel than to put screens on our machines, which make them look like everything else that is modern, instead of assuming workers can't even understand such screens?" Mike O'Brien feels that the most important issue impeding the future of the metalforming industry is the lack of commitment to education and training by business owners. "I believe the only way to resolve this problem will be to formalize training through a non-work-related process, such as a certification program," Mike says. "The main reason it is critical is that the current decision makers tend to wait and see what others do, and 'the others' are doing the same. They also don't understand the new technologies that they need to bring into their operation to remain competitive in a world market, therefore, they don't believe their own employees can understand the new technologies either. "Looking at the industry as a whole, a barrier to utilization of modern process control technology in metalforming is not its complexity, not its cost, not user unfriendliness of software, nor its suitability for the metalforming industry. On the contrary, it is the inability of industry to properly understand how to digest new technology and properly train employees - training not being limited to how to use it but more importantly why to use it; i.e., conveying to the user where the ROI is and empowering the user to harvest that ROI. "We can't compete with emerging competitors on labor cost," O'Brien warns. "Shortly, we will not be able to compete on education - look at the nationality of most graduate students in leading engineering schools in the United States. "Our only real area of strategic opportunity is one utilizing technology in order to overcome our competitive weaknesses and maintain a leadership position by being better at producing formed metal parts for technically demanding products. "In order to accomplish this we need to have an education system that produces a workforce that is technologically ahead of the work environment they are about to enter." Let me hear your views...This article is now, September 2002, five years old. Some things have improved while others have not...let me hear your views. Click this link to read the complete article.